Tatshenshini-Alsek is considered to be one of the most magnificent river systems on earth, and forms the basis of the British Columbia provincial park that bears its name. Tatshenshini-Alsek Park contains nearly one million hectares of glacier-cloaked peaks, wild rivers, grizzly bears and unusual plant communities. Situated in the very northwest corner of British Columbia, it nestles between Kluane National Park and Reserves in the Yukon and Glacier Bay & Wrangell-St. Elias National Parks and Preserves in Alaska. Combined, these parks comprise the largest protected area in the world, approximately 8.5 million hectares. The Tatshenshini-Alsek Park has been designated as a World Heritage Site by UNESCO. The Alsek and Tatshenshini rivers are responsible for much of what’s special in the area. The great gap they’ve carved through the coastal mountains allows cool, moist ocean air into the cold interior. The quick change from ocean to interior environment, frequent floods, landslides and avalanches, a varied geology and great elevation changes have together created an exceptionally diverse range of habitat conditions. Despite its remote location the ruggedly beautiful Tatshenshini-Alsek region is attracting an increasing number of recreationalists: kayakers and rafters are drawn to the two magnificent river systems; hikers and mountaineers confront a near-endless pristine wilderness that includes everything from alpine meadows to the jagged edges of the Alsek Ranges and Mt. Fairweather, the province’s highest peak at 4,633 metres; and mountain bikers can explore old mining roads and other interesting and challenging terrain. Interestingly, the Haines Highway provides an opportunity to see much of the same unusual plant and animal diversity that river users experience. 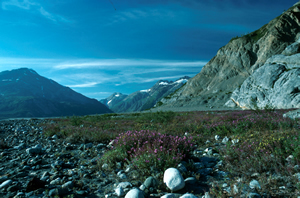 Visitors to Tatshenshini-Alsek Park should be aware that this is a rugged wilderness area; appropriate clothing, camping gear and sufficient supplies are a necessity. If planning to hike or mountain bike, it is important to remember that weather conditions in the summer are highly variable. Although a day may start with clear skies and sunshine, it can quickly change, and snow is possible any day of the year. High winds are frequent and there are often long spells of cold, wet weather. Rafters must be aware that the remoteness of this park is an essential factor to consider in trip preparation and safety. The exception to the level of difficulty is Turnback Canyon on the Alsek River. This section of the river is extremely hazardous at all water levels and travel is not recommended for even the most skilled rafter/kayaker. Portaging is recommended for all trips. Comprehensive archaeological studies of the Alsek and Tatshenshini River corridors are not yet complete. If you come across a site or artifact of cultural significance you are encouraged to report its location and what you saw to the BC Parks office in Atlin at (250) 651-7634. Please remember that it is an offence to damage or remove any natural or cultural resource from a Provincial Park. Despite the great diversity of life found in the Tatshenshini, existence for its inhabitants can be a fragile one. Winters are long, the growing season is short and damaged vegetation rehabilitates slowly. This is one reason why no motorized vehicles are allowed off the highway, except in the winter when snowmobiling is allowed within a specified area. Visitors are asked to take special care to minimize impact on the landscape. Please pack out your litter and plan any camping or campfires so there is no evidence of your passage. This will ensure that future travelers will experience the same wilderness that you do. Tatshenshini-Alsek Park is located in the extreme northwestern corner of British Columbia. The park is contiguous to the neighbouring parks in the Yukon and Alaska. Cooperative Management - The park lies entirely within the Champagne and Aishihik First Nation (CAFN) traditional territory and is managed under the terms of the 1996 Tatshenshini-Alsek Park Management Agreement signed by the Champagne and Aishihik First Nation and the Province of British Columbia. Kayaking and river-rafting opportunities are available by permit only, except for non-commercial trips along the relatively flat water on the upper Tatshenshini River from Mosquito Flats downstream to the Yukon Territory. Maps showing camping areas within the park are in the map section above. Mountain bikers can explore old mining roads and other interesting and challenging terrain. Fishing is an allowable activity in the park. Anyone fishing or angling in British Columbia must have an appropriate licence. Hikers and mountaineers confront a near-endless pristine wilderness that includes everything from alpine meadows to the jagged edges of the Alsek Ranges and Mt. Fairweather, the province’s highest peak at 4,633 metres. In this park, horses and horseback riding are allowed by letter of permission only. Hunting is allowed in the park. Please consult the current BC Hunting & Trapping Regulations Synopsis for detailed hunting information. Snowmobiling is allowed in this park but there are restricted areas. For avalanche conditions, check with Avalanche Canada. The Klondike Snowmobile Association is working with BC Parks and other agencies to ensure safe and appropriate snowmobile use in the park. the third at the new pullout at the Chuck Creek trailhead.